Today, there are few products we own that do not have an integrated circuit (IC) within. Let's skip the obvious computers, televisions, video games, and telephones. My car has one to control its ignition and coordinate its various operating systems. My sons' toys have ICs that speak and help them learn their A-B-Cs. Even my newest toaster oven has an IC chip to control its temperature as it cooks my frozen waffles. Yet it wasn't always this way. Back in the 1960's IC makers actually had trouble getting companies to use their products. The fact that integrated circuits really were just recently invented and were unproven technology had a lot to do with it. IC's very high cost versus the much cheaper and known-reliable discrete components like transistors, diodes, and resistors were another key factor. Few manufacturers were using integrated circuits - mainly defense companies that needed the miniaturization offered by an IC-based circuit and could afford the high design and manufacturing costs of this new product. In time integrated circuit technology would take off, but Texas Instruments wasn't satisfied with waiting around. TI President Pat Haggerty remembered the success his company had with another of their new products, the transistor, when TI developed a new consumer device to showcase its use - the transistor radio. So in 1965 Haggerty directed a crack Texas Instrument engineering team to embark on a project that was the turning point for electronic calculators. TI Lab Director Jack Kilby, two colleagues, Jerry Merryman, and James Van Tassel, and a few other staff members began work on a hand-held calculator. Kilby had in fact invented the integrated circuit at TI in 1958. Issue No. 1 of "The International Calculator Collector" had a feature on the CalTech with a photograph on the front cover. "The International Calculator Collector" was the journal of the International Association of Calculator Collectors, which is sadly no longer in operation. The three engineers envisioned building an IC-based, battery-powered "miniature calculator" that could add, subtract, multiply, and divide, yet still fit in the palm of your hand. After two years of development, they completed the first hand-held calculator in 1967. The battery-powered device could accept six-digit numbers, perform the four basic arithmetic functions, and print results as large as 12 digits on a thermal printer. Code-named the "Cal-Tech," the calculator measured about 4.25 by 6.15 by 1.75 inches and weighed 45 ounces. Laid out in discrete components (transistors, resistors, etc. ), the electronics within the device filled a large lab bench top. Thanks to the ingenuity of the TI team, most of the components were integrated into just four ICs. Canon Pocketronic, based on the CalTech, with integrated circuits by Texas Instruments. Like the CalTech, the calculations are printed horizontally onto the reel of paper tape, which emerges from the left side of the calculator. The prototype calculator was shown to a number of business machine and electronic companies. Canon (Japan) became very interested in this new technology; seeing the potential of miniaturized electronics to help fuel their growth in the business machine market.. Their Pocketronic, sold 3 years later in 1970, bears a striking resemblance to the original "Cal-Tech" and even kept its unique, horizontal-path, thermal printing tape system. The three engineers showed that calculators could be reduced to fit a person's hand. As more companies saw the potential, a market was created where there was none before. Businesses and consumers loved the convenience of an electronic "personal calculating device." As the calculators shrunk in size and, very quickly, in price, the market grew to mammoth proportions. Several samples of the "Cal-Tech" were built. One was given to the Smithsonian Institution in Washington, DC and another resides at the American Computer Museum in Bozeman, Montana. - a look at old news reports. excerpted from a Canon press release dated April 14, 1970. Canon Inc., in close collaboration with Texas Instruments Inc. of the United States, has successfully developed the world's first "pocketable" battery-driven electronic print-out calculator with full large-scale integrated circuitry. Called the Canon Pocketronic Printing Calculator, the new product will be marketed in Japan and abroad in the autumn of this year and the spring of next year, respectively. Retaining the features of a standard electronic desk-top calculator that can perform 12-digit calculations, the adoption of tiny electronic marvels called the LSIs has greatly reduced the size of the calculating machine - so small that it can easily fit into a pocket. Canon, since marketing the prototype Canola 130 in 1964, has led the electronic calculator industry, introduced the Canola 161 - the first electronic desk-top calculator equipped with a memory system - and IC-operated Canola 163, 162, and 141, besides the popularly priced Canola 1200 series. Canon has taken the role of a pioneer, creating the demand and ushering in the golden days of electronic desk-top calculators. The Canon Pocketronic Printing Calculator is an epoch-making produce that caters to unexploited demand and opens new markets. On the strength of its outstanding features as a pocketable and cordless calculator, it is expected to win a wide range of patronage from professional businessmen, salesmen, students and even housewives as completely personal calculators. from Electronics, January 4, 1971. Canon's pocket calculator, which was to be selling in the U.S. last month, is being delayed because production of its thermal print head by Texas Instruments is two months behind schedule. 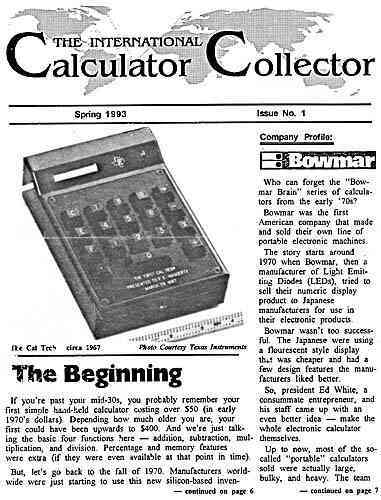 The calculator, called Pocketronic, is designed around three MOS circuits and can add, subtract, multiply, and divide; it was to sell for less than $400. TI's James W. Clifton, manager of display products, says he expects to catch up during the second quarter. The print head, which is used with thermally sensitive paper to provide hard copy readout, is a silicon array of small dots that can be heated in various combinations to form numbers and other characters. Clifton attributes the delay to the fast turnaround time initially scheduled for the project: 15 months from laboratory to the large-scale production required by the Japanese firm. The Canon calculator also used three of TI's MOS/LSI circuits. Apparently, there is no problem in delivering these circuits. from Electronics, March 13, 1972. In response to reports that it is getting into the consumer calculator market, Texas Instruments has admitted that "the possibility certainly exists that we may find it desirable to some day be in the calculator and equipment business." from Electronics, July 3, 1972. Texas Instruments has stuck a first cautious foot in the door of the consumer marketplace by introducing its hand-held calculator into home-based test markets. But response from the retailers - Foley's of Houston and Sanger-Harris in Dallas - was little short of ecstatic. Says one" "They seem more organized than most outfits in the business. They presented us with very detailed spec sheets and a better-looking machine - it's more streamlined and more tasteful than the Canadian and Japanese-made jobbies we've been selling." Adds the other: "At that price -- $149.99 - it should sell up a really big storm." 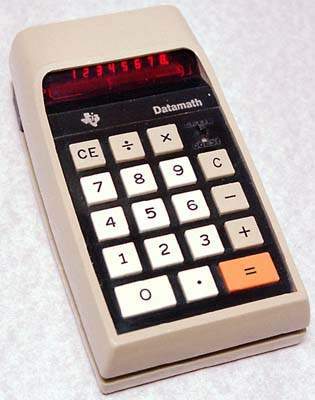 TI 2500 "Datamath", the first calculator sold by Texas Instruments. The Datamath, as its dubbed, is being sold under TI's trademark. The symbol is virtually unknown to consumers, and the retailers are taking pains to introduce it to the world. "Texas Instruments, the people that make electronic calculators work, now make an electronic calculator" was the headline on Foley's ad, followed by a description of the firm's MOS LSI one-chip calculator work. The 12-ounce, battery-operated device, guaranteed for one year, features an eight-digit light-emitting-diode readout that displays numerals, overflow indication, and low-battery warning. Except for the character in the first-digit position, the display turns off after about 15 seconds. It can be recalled via a dual-function button. A line of three new calculators introduced today marks the formal entry of Texas Instruments into the electronic calculator market. The three new calculators are the TI-2500 portable calculator and the TI-3000 and TI-3500 desk models. Commenting on TI's entry into the calculator business Jay Rodney Reese, Vice President and Manager of the company's Solid State Products Division, stated, "Our company is dedicated to the belief that electronics will pervade all segments of our society. As electronics continues to open up new markets, Texas Instruments will analyze these high growth opportunities to determine if our company can make a real contribution to society. We believe that an exceptionally good match between the needs of the market and our technological and manufacturing capabilities exists in the electronic calculator field." The TI-2500 portable electronic calculator is a four-function, full-floating-decimal-point unit with an eight-digit light-emitting-diode display. With a suggested retail price of under $120, the TI-2500 calculator is rechargeable and capable of portable or ac operation. The TI-2500 unit uses algebraic entry - ideal for general public use. Built entirely of American-made components, most of them produced by Texas Instruments, the calculators are manufactured in TI's Dallas facility. The heart of the calculators, the MOS/LSI calculator-on-a-chip, is produced in TI's plants in Houston, Texas. The keyboards come from the TI facility in Attleboro, Mass. ; while the plastic cases are molded in the company's Sherman, Texas location. The light-emitting diode (LED) displays used in the TI-2500 calculator are produced by TI's optoelectronics department in Dallas. A basic patent for miniature electronic calculators has been issued to Texas Instruments Incorporated. The patent is for personal-sized, batter-operated calculators which have their main electronic circuitry in a single integrated semiconductor circuit array, such as the popular "one-chip" calculators. This represents another in a series of landmark developments at Texas Instruments directly relating to miniature calculators. In 1958, Texas Instruments invented the first integrated circuit, subsequently patented in 1964. This key innovation resulted in dramatic change in virtually all areas of electronic equipment design, including calculators. This was followed by major developments fundamental to MOS/LSI integrated circuitry - the basic technology behind today's miniature calculators. Two key patents on MOS/LSI were awarded to TI in 1972. A third significant milestone was the introduction by TI in 1971 of the "calculator-on-a-chip" MOS/LSI circuit which became the heart of modern miniature calculators. The miniature calculator described in the new TI patent (editor's note - this was the "Cal-Tech") was the result of work done at TI in the mid-60s. The patent (Number 3,819,921), originally filed in 1967, was awarded to TI June 25, 1974. This miniature calculator (the world's first) employed a large-scale integrated semiconductor array containing the equivalent of thousands of discrete semiconductor devices. Measuring 4-1/4 x 6-1/8 x 1-3/4 inches, it was the first mini-calculator to have the high degree of computational power found only at the time in considerably larger machines. The inventors are Jack S. Kilby, Jerry Merryman, and Jim Van Tassel. Kilby invented the integrated circuit in 1958 and was later awarded the National Science Medal by President Richard Nixon for his pioneering work in integrated circuits. The working heart of the first miniature calculator was an integrated semiconductor circuit array that contained all the necessary electronics for performing addition, subtraction, multiplication, and division. Other elements of this early example of the miniature calculator included a small keyboard with 18 keys and a visual display in the form of a semiconductor thermal printer for printing out calculations of up to 12 decimal digits. Since the invention of this first miniature calculator, semiconductor technology has had a dramatic impact on the electronic calculator industry with ever-decreasing prices characteristic of this new breed of computational machines. These price reductions have been a result of advances in solid-state technology and economies of large-scale calculator manufacturing. With the advent of MOS/LSI in 1970, early portable calculators using more than one major IC and priced at around $300 to $500 were produced using LSI circuits. TI's single MOS/LSI "calculator-on-a-chip" IC in 1971 heralded the age of the low-cost consumer handheld calculator and ignited the burgeoning electronic calculator market. Texas Instruments intends to make licenses on this miniature calculator patent generally available to the industry in the near future. For more on Texas Instruments calculators see the article "Texas Instruments Calculators 1972 - 1979: How rare are they?" on this site.